While all the cakes were cooling, I dug around in the freezer through my frozen cake reserves and grabbed a bag of chocolate cake. 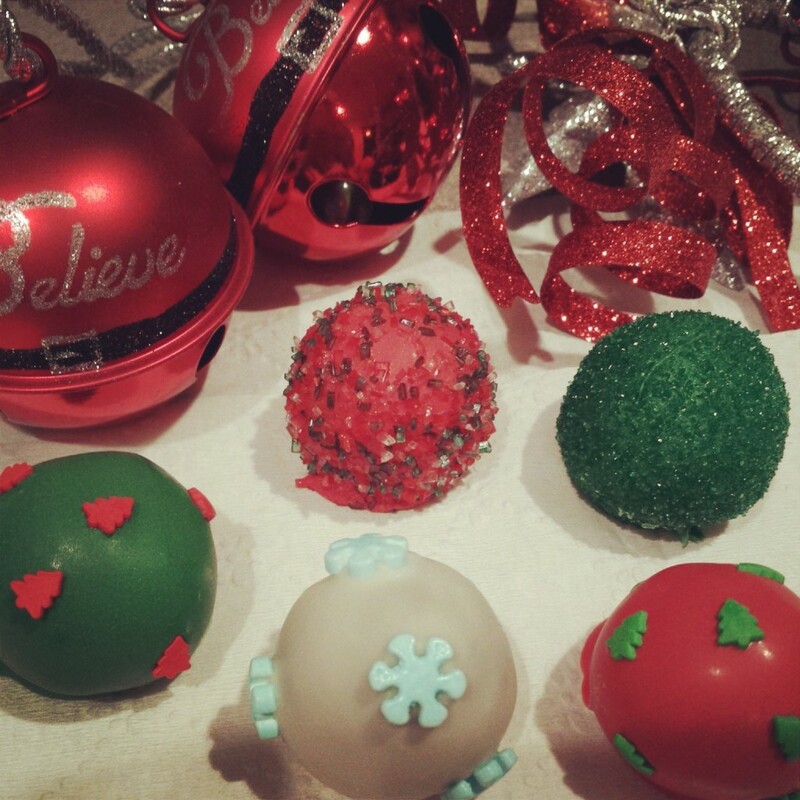 The other contest creation I had in mind was a go-to Christmas staple: cake ball ornaments that would perfectly perch on my trusty Godiva ™ truffle tree. I honestly couldn’t decide which one would be better so I decided to make both the cake balls and the cake “gift” and see how it went. Haha After the cake was processed and mashed with frosting, rolled into balls and popped in the fridge, I mixed some red gel into white vanilla frosting and iced the cupcakes and the little contest cake. The next step was setting up the cake ball station. I heated up 3 different containers of red, green and white candy melts, and arranged all the sprinkles in neat little bowls so I could be organized and quick be in “ball factory mode.” Throwing sprinkles on a freshly dipped cake ball is easy; perfectly placing several large sprinkles/candies on a rapidly drying cake ball with deft precision… not so easy. I think I have a decent enough handle on this so there was only one ball f*ck up. Side note: if I ever had to babysit one of my more well-behaved 2397502 nieces/nephews/little cousins, I’d let them make their own cake pops. Who doesn’t love dipping sh*t in chocolate and sprinkles??? 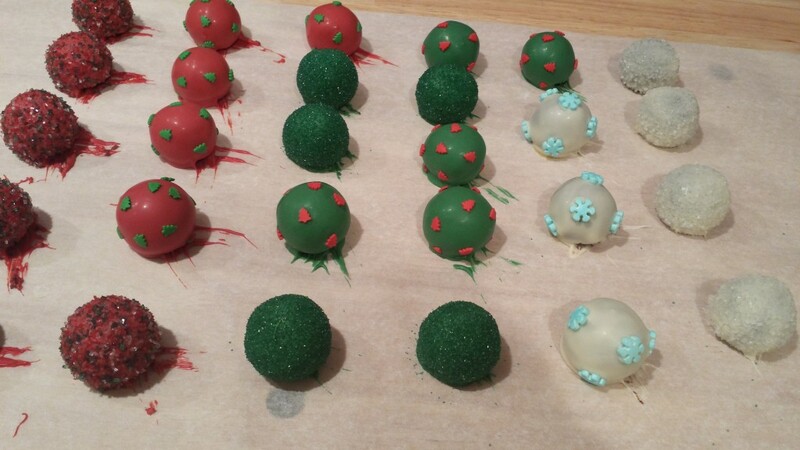 After I churned out 33 beautifully decorated holiday themed cake balls, I let them set in the fridge, then pulled out another sheet of parchment paper to decorate the gift cake. I heated up some marshmallow fondant and kneaded away. 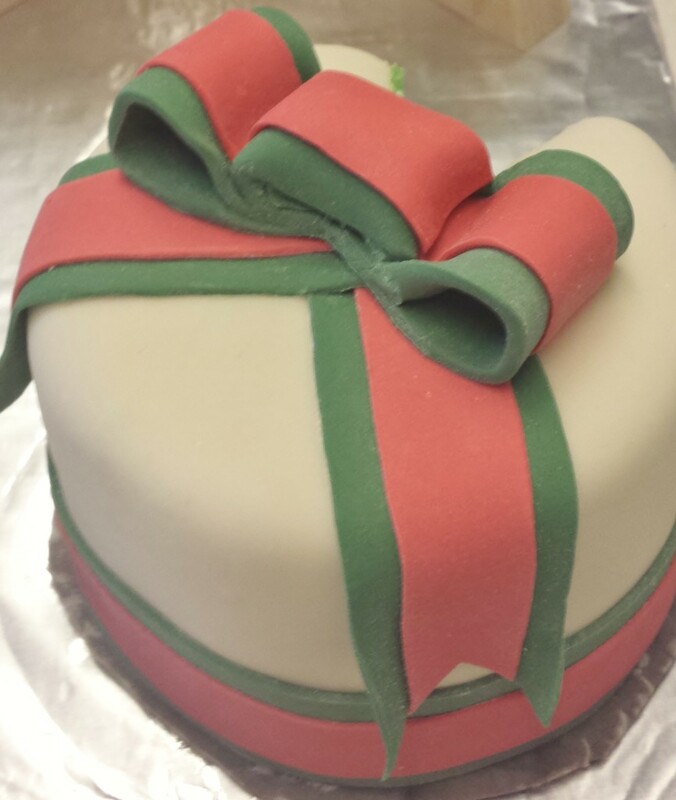 Once the fondant was smooth enough, I rolled it out and covered the small little cake. I can’t say it enough: I love working with fondant on these little cakes. They’re so much easier to cover and decorate than a huge 16” cake tier. On to making the ribbon…. Initially I was going to put a big green bow on it, but then, being the overambitious weirdo that I am, I decided that the first time I made a fondant ribbon, it would be a spectacular double color ribbon. Because why the F not? I ripped off a chunk of the remaining white fondant and mixed it with red gel, then wrapped it in plastic wrap to keep it from drying out. 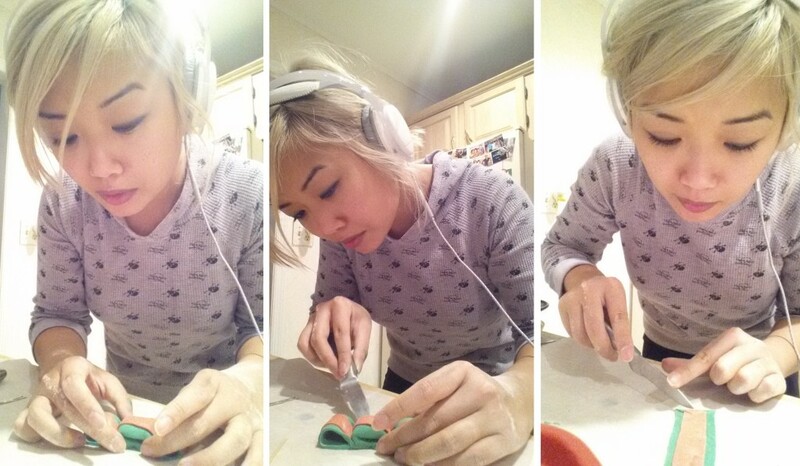 I mixed the rest of the white marshmallow fondant with green gel and rolled out a thin, long strip of fondant. I measured out 1 ½” strips and sliced away. I shaped one strip to form the loops and the knot and stuck 2 fondue sticks in the loopholes to help them keep their shape. Then I cut a “V” notch out of 2 ribbon strips for the ribbon pulls, et voila! A tasty ribbon for my cake. Ideally, I would have loved to have more time to shape these things and let the fondant bow loops set, but it didn’t look bad @ all. I cut out another strip to wrap around the bottom of the cake (to hide the edges and extra bits of frosting that blobbed out). The second overlay section of the ribbon was made from 1” strips of the red fondant. I tucked in pieces of red over the green and by the time I was done, it was a pretty little Christmassy pageant cake with a fancy two-toned bow. Dang, I am GOOD. I looked at the clock and it was 5 am so I packed everything up (the present cake, the cake balls, the tree stand, and 3 dozen mini cupcakes) to bring to work, showered, got ready, and we headed out the door. You know one of those days at work where everyone (even the meanest, unhappiest d-bag) is cheerful and friendly b/c it’s one of those casual, hang out days? This was one of those days in the finance department. People got their work done and emails sent in the morning, and then when noon rolled around, all the desserts were set up in the conference room for the party, people overloaded on sugar, everyone was smiling and chatty, and we got our secret santa gifts. I happened to sit a few feet away from my gift recipient and she liked the nicely packaged bath set/bath soaps/stationery/picture frame combo present I got her. I think I got THE best gift ever: it was a squishy Stuart figure from “Despicable Me 2” that made a ton of silly noises whenever you squeezed his tummy. I loved LOVED it and knew it had to be from one of my friends (it was!). 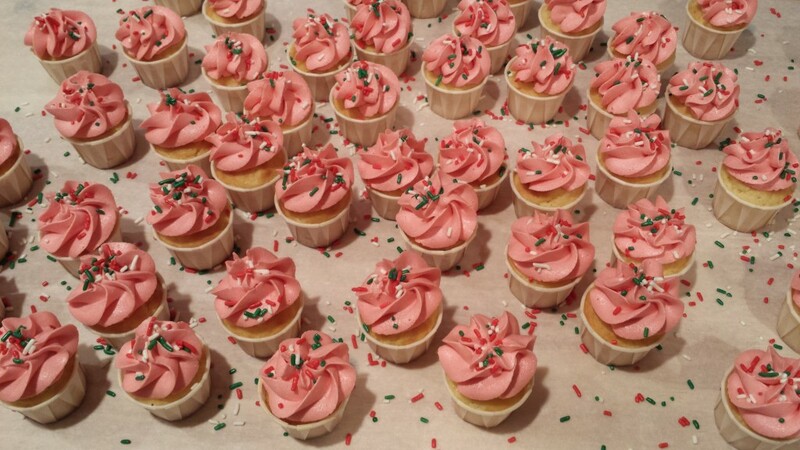 There was wayyy too much dessert going on, but even so, all of my cupcake minis were gone by the end of the afternoon (people heard they were mine and had to eat them hahaha). 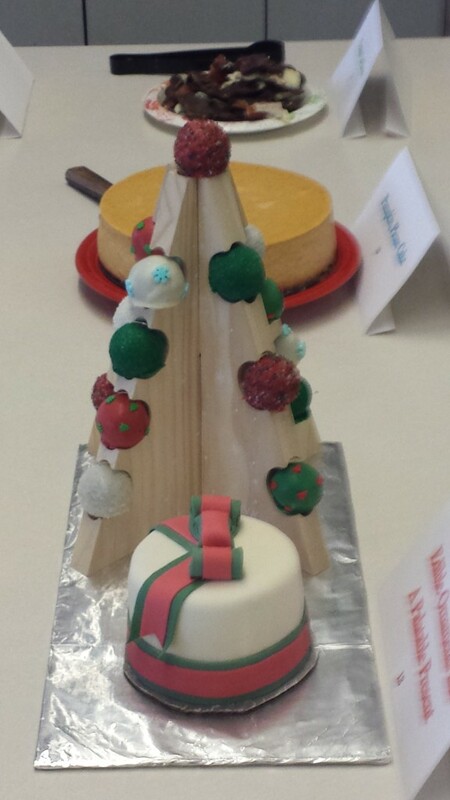 Unfortunately, I wasn’t able to get many pics of the set up and I didn’t have a chance to take photos before the contest; the best ones I have of the gift cake were after the judges cut a slice. Haha All the contestants had to make up names for their treats; mine was kinda “eh” and I tried to incorporate alliteration so it would have a ring to it (Edible Ornaments and a Palatable Present) but I distinctly remember someone brought in liquor-based cupcakes and called them “Irish-American car bomb cupcakes”… totally NOT PC but really memorable and hilarious. A made a beautiful and delicious Danish arrangement (seriously, his stuff looks straight out of “Saveur” or “Bon Appetit”… I think I’ve named all the big food mags by now) and there were some great family recipe dishes and a couple desserts with bacon. Oh this? Yeah, I just whipped it up last night. It’s nothing. The desserts were rated on 3 categories: taste, presentation, and creativity. 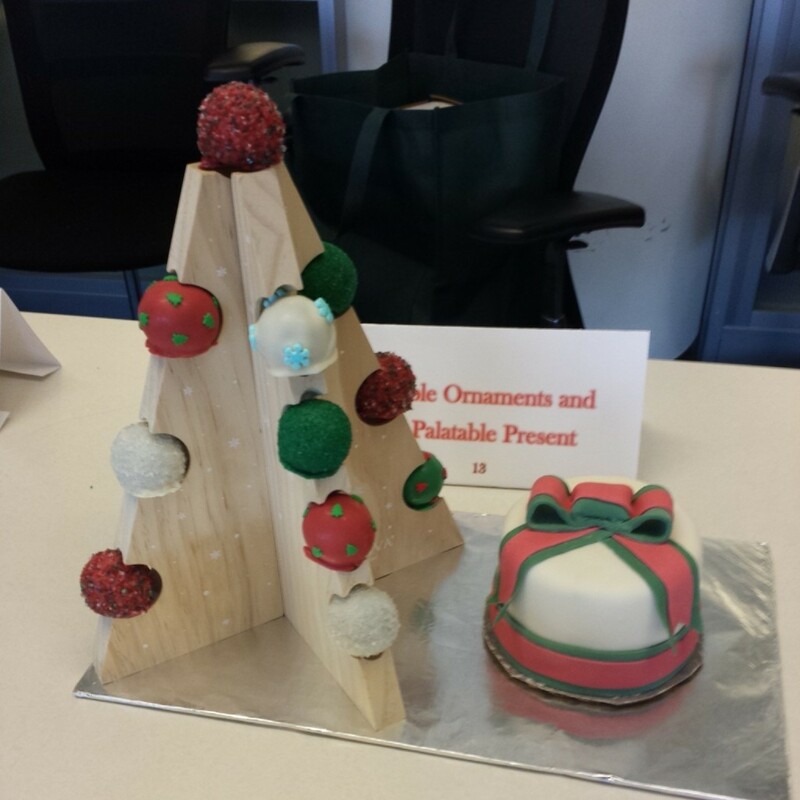 I think I placed top 5 in taste, but I won first in presentation and creativity (thanks to A telling me to make it all holiday-themed), so I won grand prize overall. (I think some ppl were bitter that an “outsider” won. Whatever. I killed everyone. It was a massacre. They really had no chance and no one saw me coming. A even joked that he tried to sabotage me by telling me about the contest on such short notice and apologized to everyone else in News for bringing in the dark horse Hahaha) Once the contest was over, everyone was able to taste all the entries. The cake balls and the little cake were gone in minutes! I won all these random prizes (perfume, Fandango gift card, designer cosmetic bags with travel accessories, an opera book…) but bragging rights were the best. That’s two major wins in less than a week, and more ppl telling me I shouldn’t be a “Bob.” The ultimate prize: passing out on the train ride home and actually getting some sleep. My win was in the company newsletter. And no, I’m not in this picture. Merry Christmas to all, and to all a good ni— zzzzzzzz….